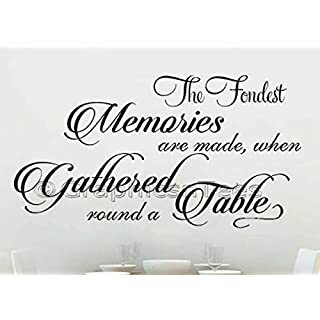 Inspirational WallArt Inspirational WallArt is a unique and exciting concept that combines beautiful decorative pictures with inspirational phrases. The 3D effect gives the stickers stunning wooden frames that are so realistic you won't be able to tell that it's not real wood. Inspirational WallArt is a series of dozens of pictures from a wide variety of categories. Each package consists of 6 removable and reusable wall stickers. The size of each sticker is 17 cm x 24 cm, or 6.70" x 9.45", and can be applied to any surface, including walls, dressers, doors, etc. The inspirational phrases add immense value to the product, making it a meaningful and wonderful present to anyone who receives it. 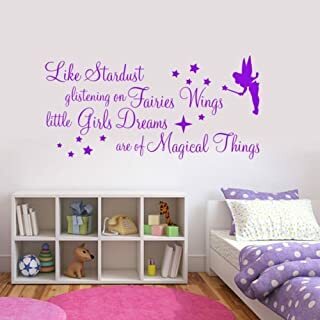 With the wide assortment of pictures currently available you can find something for any room, including the baby's room, dining area, kitchen, and additional rooms in the home and at the office. Inspirational WallArt is a splendid motivational gift to give and receive. We strive to provide you with products of the highest quality and we hope you thoroughly enjoy them. Brand New In package. 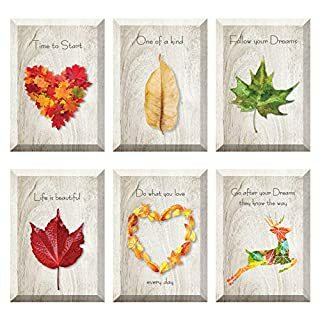 6 pcs 3D Inspirational WallArt in package. wall sticker size: 24cm x 17cm / 9.45" x 6.70" (Each). Package Weight: 150 gr / 0.35 lb. Material: Vinyl. Instructions: 1. Choose the wall according to our recommendation. 2. Draw a straight line with a pencil (a leveler or a measuring tape). 3. Gently peal the release paper off the back of the wall sticker, then attach the wall sticker exactly on the drawn line (by moving your hand left and right) from bottom to top. Make sure no air bubbles are caught between the wall and the wall sticker. 4. Erase the pencil marks. 5. Look from afar to see if you can tell this is not a real pictures? Product Info: Nisha stickers are a revolutionary decorative concept. Nisha is the only company in the world launching it. 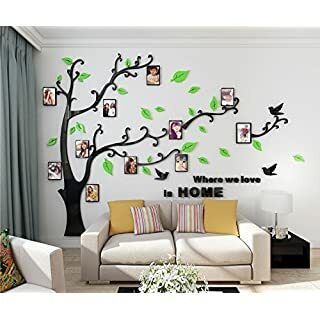 The wall sticker come in hundreds of various images and sizes, and can give a room the effect of a uniquely designed wall. 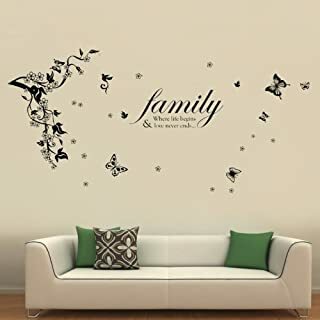 Nisha wall stickers are suitable for nurseries, children's bedrooms, living rooms, dining rooms, restaurants, waiting rooms, offices, etc Brand New In package. 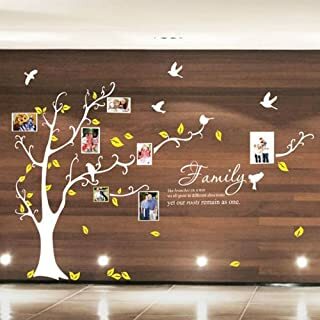 4 pcs 3D Nisha wall sticker in package. 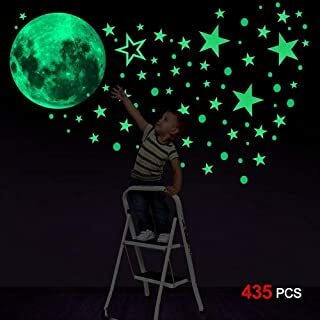 wall sticker size: 32cm x 32cm / 12.50" x 12.50" (Each) Package Weight: 320 gr / 0.70 lb Istractions: 1. 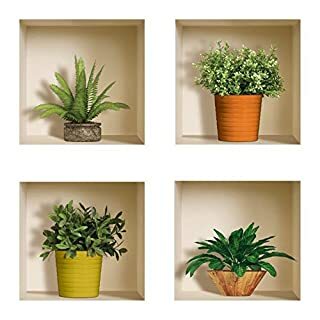 Choose the wall according to our recommendation. 2. Draw a straight line with a pencil (a leveler or a measuring tape). 3. 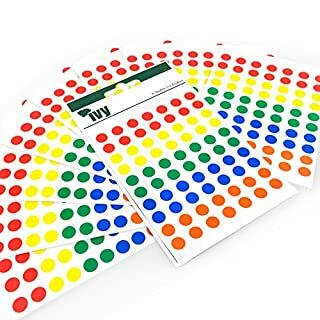 Gently peal the release paper off the back of the wall sticker, then attach the wall sticker exactly on the drawn line (by moving your hand left and right) from bottom to top. Make sure no air bubbles are caught between the wall and the wall sticker. 4. Erase the pencil marks. 5.Look from afar to see if you can tell this is not a real niche? ★★★ Only after putting the niche stickers on the wall, you can see the AMAZING 3D effect ★★★. These labels are Ivy branded and are made in the UK. About Us Bespoke Graphics is a family run business based in Tamworth, Staffordshire, where we pride ourselves on quality and excellent customer service. As a small business the promotion of our products and services are relied upon 'word of mouth'. We want you to be assured your shopping experience with us will be 100% satisfactory. Our images are not only original but iconic, exciting, nostalgic and are always conversation pieces.They will last and look great in your home or office for many years to come. They are made to order and created on our own premises, we do our own quality control. 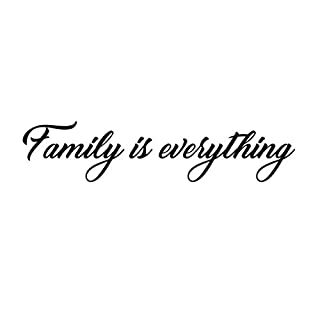 Family Wall Sticker Quote. 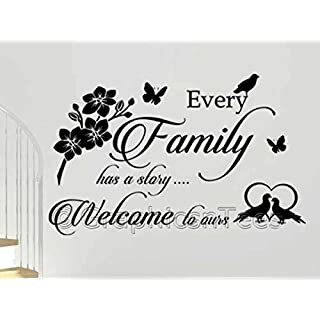 'Every Family Has A Story, Welcome To Ours'. This lovely design looks great and enhances any interior wall and will give it a stylish contemporary feel. Available in various sizes and colours (please email with your colour choice from colour chart). 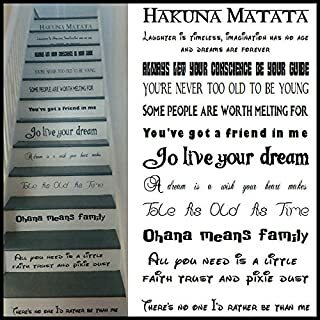 All our interior wall designs are made to order and come with a matt finish and depending on the size you order, your graphic may be sent in more than one piece making applying the decal as simple as possible. However, your graphic will NOT come as separate individual letters making it extremely difficult to line up. It's also worth noting that we only use the finest grade quality branded vinyl supplied direct in the UK which have superb adhesive qualities and guarantees your decal will stay where it's supposed to (not like the low price, low quality, low tack vinyl). All our graphics come ready to use with backing application tape and easy to follow fitting instructions. We even include a link to our FREE videos so you can watch exactly how to apply your new sticker guaranteeing you do the job right first time with no problems. All our decals can be applied to any smooth, flat, clean surface, (Painted walls, Fridges, Cupboards, Glass, Plastic etc). 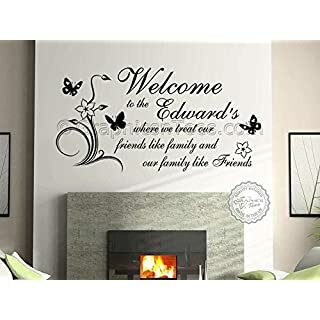 Family Wall Sticker Quote, Personalised Family Name, Welcome, Friends Like Family. This lovely design looks great and enhances any interior wall and will give it a stylish contemporary feel. Available in various sizes and colours (please email with your colour choice from colour chart). 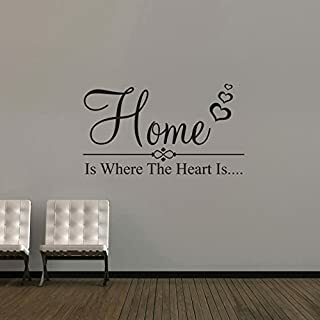 All our interior wall designs are made to order and come with a matt finish and depending on the size you order, your graphic may be sent in more than one piece making applying the decal as simple as possible. However, your graphic will NOT come as separate individual letters making it extremely difficult to line up. It's also worth noting that we only use the finest grade quality branded vinyl supplied direct in the UK which have superb adhesive qualities and guarantees your decal will stay where it's supposed to (not like the low price, low quality, low tack vinyl). All our graphics come ready to use with backing application tape and easy to follow fitting instructions. We even include a link to our FREE videos so you can watch exactly how to apply your new sticker guaranteeing you do the job right first time with no problems. All our decals can be applied to any smooth, flat, clean surface, (Painted walls, Fridges, Cupboards, Glass, Plastic etc). 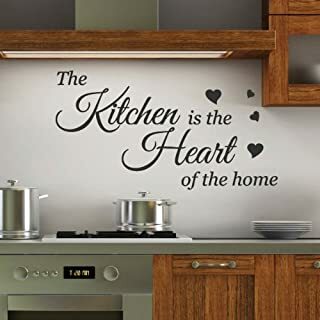 Dining Room, Kitchen, Kitchen Diner, Family Wall decal quote. 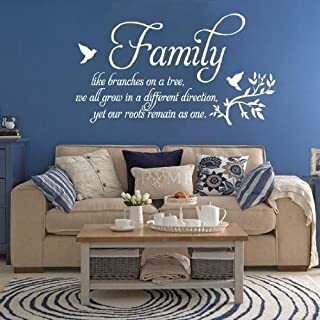 This lovely family design looks great and enhances any interior wall and will give it a stylish contemporary look. Available in various colours (please add note with your colour choice from chart) and sizes. All our interior wall designs come with a matt finish and depending on the size you order, your graphic may be sent in more than one piece making applying the decal as simple as possible. However, your graphic will NOT come as separate individual letters making it extremely difficult to line up. It's also worth noting that we only use the finest grade quality branded vinyl supplied direct in the UK which has superb adhesive qualities and guarantees your decal will stay where it's supposed to (not like the low price, low quality, low tack vinyl). All our graphics come ready to use with backing application tape and easy to follow fitting instructions. We even include a link to our FREE videos so you can watch exactly how to apply your new sticker guaranteeing you do the job right first time with no problems. All our decals can be applied to any smooth, flat, clean surface, (Painted walls, Wallpaper, Fridges, Cupboards, Glass, Plastic etc).right first time with no problems. All our decals can be applied to any smooth, flat, clean surface, (Painted walls, Wallpaper, Fridges, Cupboards, Glass, Plastic etc).problems. All our decals can be applied to any smooth, flat, clean surface, (Painted walls, Wallpaper, Fridges, Glass, Plastic etc). Make your home unique with one of the latest trends -- Wall Decals. With Wall Decals, you can transfer your home in seconds, and they just look like hand painted! Wall decals are easy to apply and can be easily removed without damaging your walls. 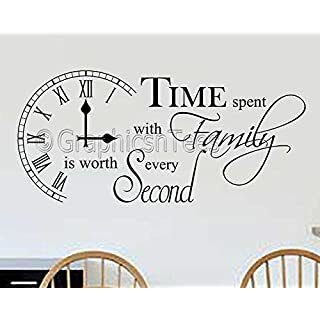 Our wall stickers can be applied to walls, doors, windows, or any other clean smooth surface, and they can last 3-5 years. Please see the above photo for size details and colours available. If you like to have extra differnt heart colour, choose 2 colour option from colour menu bar and send us colours via amazon mesage box. We do customized orders. please contact us for your own design or size inquiry.